If you are planning a barbecue for the Fourth of July, this red, white and blue berry torte should make an appearance on the menu. In keeping with the patriotic theme, this dessert naturally sports the colors of the American flag. 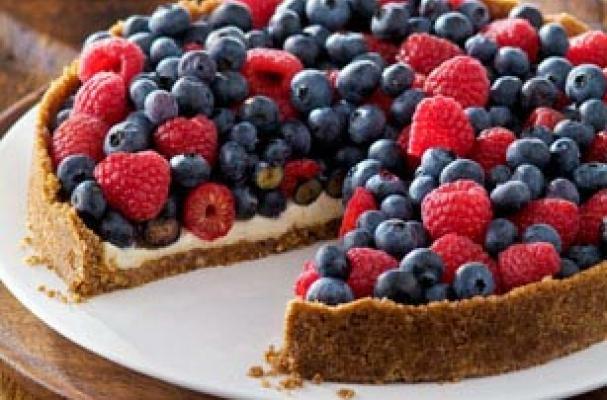 A gingersnap cookie crust is filled with a rich cream cheese batter and topped with fresh berries. While the recipe calls for only blueberries and raspberries, feel free to throw in strawberries and blackberries as well. The best part about this dessert is that you only bake it for five minutes. The cookie crumbs are combined with butter and baked for a few minutes so that it can set. Otherwise, the torte chills in the fridge for four or more hours until it's serving time. This Fourth of July torte is easy, festive and delicious. Mix cookie crumbs, nuts and butter; press onto bottom and 1 inch up side of 9-inch springform pan. Bake 5 min. ; cool completely. Beat cream cheese, sugar and vanilla with mixer until blended; spread onto bottom of crust. Top with berries.